This book provides a great insight into the history and design of type, and quite a bit of the commentary is useful even today. 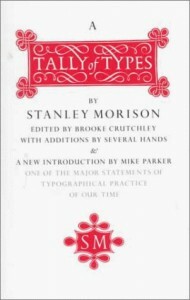 Morison is well known, of course, for the Times New Roman face - and there is a section in the book on that face. But his commentary on the designing of faces like Plantin and Bembo is much more interesting, if you ask me. Also, if you are at all a fan of Eric Gill, you will like the section on Perpetua and Felicity. Anyone interested in the history of type should have this book, that much is certain.